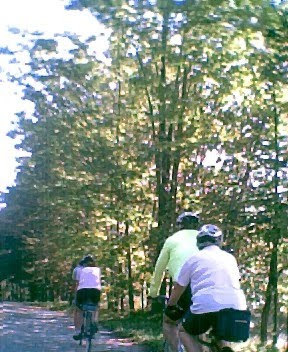 The Two Wheels Over Easy breakfast ride last Friday started in Gardiner at the southern entrance to the Kennebec River Rail Trail. We had five cyclists in attendance, on three bikes. 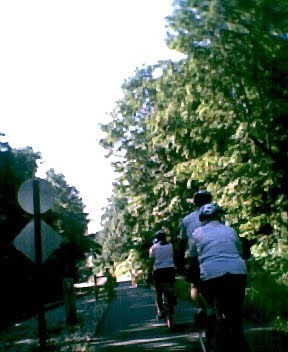 There are a number of numerical combinations that could account for this, but let's just say that this was the first KVBC ride in which the tandems outnumbered the singles by two to one. Once again, we had really fine early morning weather. The rail trail was not quite deserted - there were a few other cyclists, joggers, and walkers - but there were moments when it seemed that we had the entire trail to ourselves. 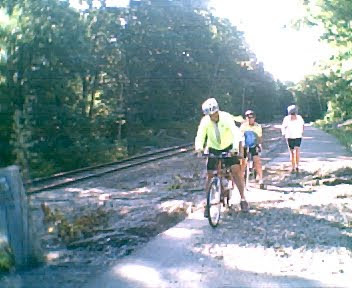 We rode the entire rail trail from Gardiner to Augusta. Except for a short section of hard-packed gravel near Augusta, the trail was smoothly paved. The recent heavy rains had washed out the hillside in some spots, leaving some impressive deposits of sand and gravel which almost entirely covered the trail in few places. But these were fairly easy to pick our way through. The trail makes use of the old railroad bed, alongside some seldom-used but still active rails. Only for a short stretch in downtown Hallowell does the trail follow urban streets. 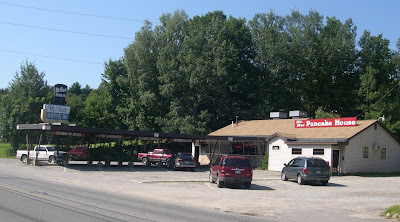 The breakfast stop was at the Hi-Hat Pancake House, an old "car-hop" on Rt.201 in Farmingdale, right across from the rail trail. The Hi-Hat provides a substantial breakfast menu of substantial breakfasts. In my case, I opted for a spinach & feta cheese omelet, homefries, toast & coffee, and for once, it was almost too much to take in. Almost. Once again on one of these Two Wheels rides I found myself in awe of one of my co-riders, who ordered, without hesitation, "Waffles with Fruit." This concoction, when served, turned out to be a large plate-sized waffle at least an inch and a half thick, covered with strawberries and a small mountain of whipped cream. I'm beginning to wonder if this is going to develop into an ongoing contest as to who can order the most decadent-looking breakfast on one of these rides. Breakfast concluded, the two tandems set off to return to the start in Gardiner, while I headed back to Hallowell where I had started my ride. A very pleasant morning ride, beating the heat that arrived by mid-day. Many thanks to Frank, who put the ride together, and the two tandem crews who turned out and turned heads up and down the rail trail. If you have a suggestion for a breakfast ride, let us know and we'll try to include it in the club's schedule. Correction: Rt 201 in Gardiner.